This site is for financial software developers and network service providers who would like to add support for the national e-invoicing framework to their products and services. The business case for doing so is compelling. As a business, I want to send electronic invoices to my customer systems and know the payment status so I can manage my cashflow and get cheap debtor financing if I need it. As a business, I want all invoices and tax receipts from my authorised suppliers to be automatically loaded to my financial system, ready for my approval so I can reduce my administration burden. Electronic Document Exchange (EDI) is nothing new but has traditionally been complex, expensive, and implemented as hub-based and incompatible “islands of automation”. Participants often have to connect to many traditional EDI hubs in order to interact with their trading partners. This site defines an alternative peer-to-peer document exchange framework that is semantically equivalent (and therefore interoperable) with legacy EDI but is based on modern and ubiquitous internet protocols such as REST, JSON, and OIDC. The result is a simpler, cheaper, and more secure framework. All specification development is done as an open community processes based around the GitHub collaborative development environment using a transparent governance model. You can help with development or join the conversation, or just keep yourself informed. The governance model explains which specifications apply to which kind of implementer. But the most common implementer is the software vendor that wants to participate in the network and provide their customers with the benefits of supply chain automation and trade finance. The good news is that, as a software vendor, you need only implement one or more of the semantic specifications (eg BILL for e-invoicing) and support the client role in the TAP-GW specification (open source tools available) so that you can use the services of any access point provider. Unlike single provider APIs (eg google or facebook), a B2B community needs all businesses to implement the same interface so that the same document format (e.g. an invoice) can be sent from any business to any other business. There also needs to be a way to discover the service endpoint for any specific business so that the sender system knows where to send messages. The diagram shows how it works. The Ausdigital technical and semantic specifications are positioned on the diagram via the blue and green tags. A business that wishes to participate in the network first proves their identity via an OIDC “log in with..” an identity provider service. Different identity assurance levels are supported in an open identity market as defined by the IDP specification. ACME’s supplier “Widget Co” has also verified identity and published their services to a DCP register. When Widget Co wants to send and invoice to ACME, then Widget Co will lookup ACME’s service information (using ACME’s ABN as the DCL lookup key). Widget will create an invoice in accordance with the BILL specification then digitally sign it, then encrypt it using ACME’s public key. Then Widget will POST the invoice to ACME’s service end point in accordance with the TAP (Transaction Access Point) specification. ACME’s TAP will receive the invoice and verify Widget’s signature. 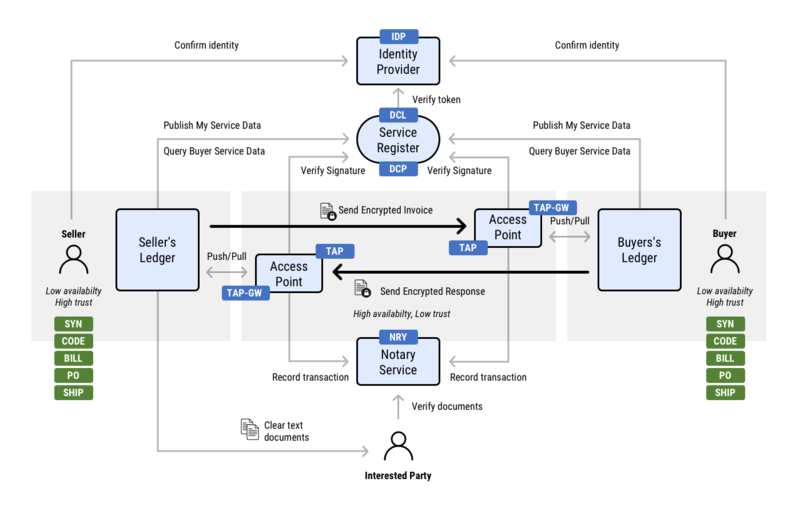 ACME will get the invoice via the TAP-GW protocol, decrypt the invoice, and process it in ACME’s financial system. At each key stage in the invoice lifecycle (received, approved/disputed, paid), ACME will send an invoice response document to Widget Co. Both Widget and ACME will optionally record the signed invoices and responses in the blockchain using the Notary NRY specification. This provides both a non-repudiable transaction audit log and can be used by authorised third parties to provide additional services like invoice financing (so Widget Co can get paid immediately even though ACME’s terms are 60 days net). In most cases, all these steps 1 to 7 will be performed automatically by ACME’s and Widget’s financial software. The network infrastructure will be often provided by a network service provider (which implements all the blue technical specifications), leaving the ledger software to focus on the green semantic specifications and just consume the blue services. The standardised TAP-GW protocol allows businesses like ACME or Widget Co to change network service providers at any time with minimal transfer cost, avoiding any lock-in to network service providers. The JSON and CODE specification define some common foundation standards that all the semantic specifications (eg BILL, PO, and SHIP) depend upon. The success of the interoperability framework depends on uptake by the ledger software providers. Those systems must implement a number of interfaces in a consistent way - which requires clear standards, good test services, and easy to use tooling. That is the purpose of this site. Keep Informed. Subscribe to the regular Ausdigital newsletter. We’ll update you about the latest developments and opportunities at most once per week and you can un-subscribe anytime. Join the conversation, Join the Ausdigital Slack team and subscribe to as many channels as you wish (there’s one for each spec and a general channel). You can join the conversation, make suggestions, or ask questions and get help. Help with development. Github is our main tool for development of the Ausdigital specifications and reference implementations. It’s all in the open and all open source. If you’d like to see a change or improvement then raise an issue in the relevant repository. If the subsequent discussion indicates that it’s a good idea likely to be accepted by the editor then feel free to make a corresponding pull request with your contribution! This page was generated by GitHub Pages. Comments, issues and suggestions are welcome in the ticket system. Pull requests welcome in the site repository.